If your gym routine is becoming a drag, and running in the heat is not doing it for you either – try surfing inside. With SURFSET Toronto (2481 Yonge St.), you can get all the benefits of surfing, without the wipeouts. We chatted with Alexandra Vinichenko of SURFSET Toronto to get the deets. SDTC: How closely does SURFSET simulate a real surfing experience? 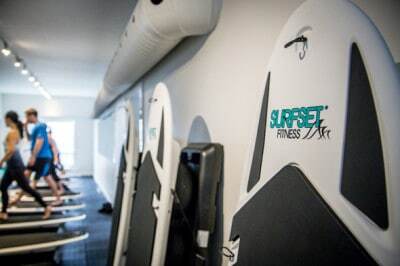 AV: The SURFSET workout mimics real surfing motions and uses the same muscles that you would use while actually surfing. The SURFSET board is strapped to three inflated balls that simulate the motion of waves underneath your surfboard. This is about as close as it gets to actually riding, but it’s still a very different feeling than catching an actual wave in the ocean. Although we can’t promise our classes will lead to a lucrative surfing career, we do guarantee you’ll be stronger, more balanced and have more confidence on a board in the water! There are a few different elements to take into account as we have five types of classes and the level of difficulty ranges, depending on your familiarity with the board and the type of exercise you’re used to. If we had to rate it, our classes probably fall anywhere from a 4-9 range. It’s always a great workout but it’s also very doable. We’ve gotten a lot of feedback from clients who have said that they have never loved working out, but now they look forward to their workout with us. They are also amazed by how much they can sweat and how good they feel after a forty-five-minute class. The atmosphere we provide is a lot of fun. The instructors are motivating, friendly and are always playing great music to pump you up. The fact that you are actually working out on a surfboard is so unique as well. It’s impossible not to laugh when you’re trying to strike a new pose or nail down a new workout while balancing on the board. It’s challenging, but in a good way! Our favourite aspect is seeing clients progressing, not only by using heavier weights, but also by being able to push their bodies further on the board. 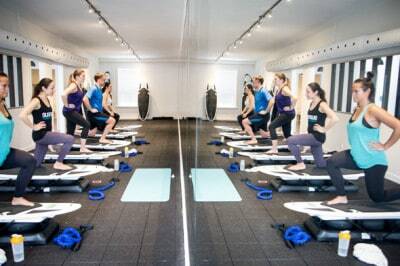 We love the community feel and the laid-back atmosphere of the studio, coupled with (of course) a challenging workout! Just have fun! The boards have adjustable straps and can accommodate a variety of fitness levels. We have slightly more inflated beginner boards, which provide some extra stability, and our instructors are always excited to give you tips or modify the workout to accommodate injuries. It can take a couple of classes to start feeling really stable on the board, but it’s great to start seeing that natural progression. It’s important to keep in mind that everyone was once a beginner, and after some practice it starts to feel natural! The biggest tip we have is to sign up for a class! We are excited to get you on a board. Wanna try SURFSET? 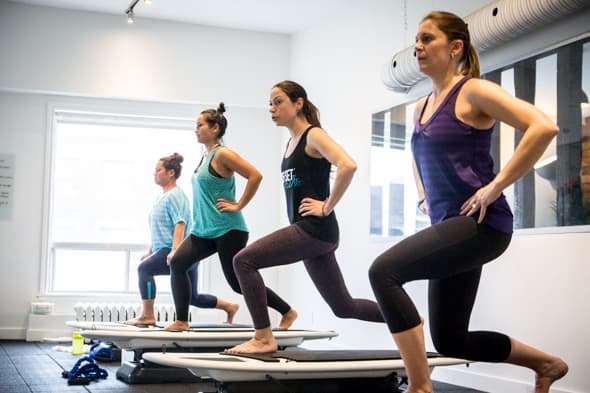 The first Sunday of every month at noon they offer a $10 Beginner Balance class with all proceeds supporting WWF-Canada’s vital conservation work. They also have a summer promotion for $10 morning weekday classes and a $45 unlimited two-week special introductory offer. Visit here. There are a few different elements to take into account as we have five types http://congtysangoviet.com/bang-bao-gia-san-go/ of classes and the level of difficulty ranges, depending on your familiarity with the board and the type of exercise you’re used to. If we had to rate it, our classes probably fall anywhere from a 4-9 range. It’s always a great workout but it’s also very doable. http://dongyhuynhtantrieu.com/thuoc-dong-y-keo-dai-thoi-gian-quan-he-ben-vung/Một khi Thận khí hư thì dương không thể cường, như lốp xe xì hơi, làm sao chạy được.